October 2015 • SMT Magazine 67 Gold EmbrittlEmEnt mitiGation the Technical Programme, Inter/Nepcon (Octo- ber, 1968), pp. 211–231. 6. 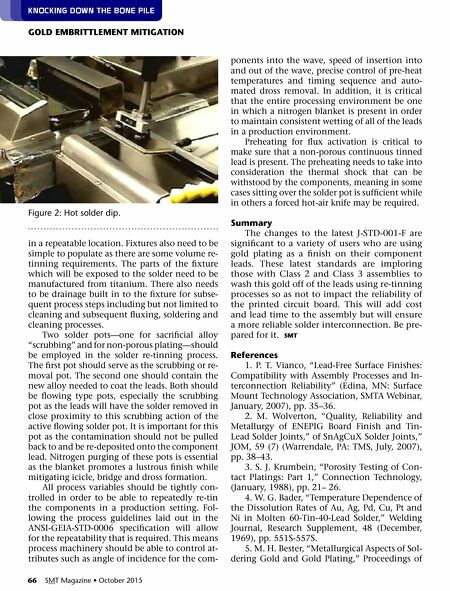 J. Glazer, P. A. Kramer and J. W. Morris, Jr., "Effect of Au on the Reliability of Fine Pitch Sur- face Mount Solder Joints," Proceedings of Sur- face Mount International (Edina, MN: Surface Mount International, SMTA, 1991), pp.629–639. 7. R. N. Wild, "Effects of Gold on the Prop- erties of Solders" (Owego, NY: IBM Federal Sys- tems Division, IBM No. :67-825-2157, January, 1968), 31 pages. 8. F. G. Foster, "Embrittlement of Solder by Gold from Plated Surfaces," ASTM STP 319 (1963), pp. 13–19. 9. C. Hillman, N. Blattau, J. Arnold, T. John- ston, S. Gulbrandsen, J. Silk, A. Chiu and Y-H Chan, "Gold Embrittlement in Leadfree Sol- der," SMTA Journal, Vol. 26, Issue 4 (Edina, MN: SMTA, 2013), pp. 23–34. 10. J. Pan, J. Silk, M. Powers and P. Hyland, "Effect of Gold Content on the Reliability of SnAgCu Solder Joints," IPC APEX EXPO 2011 (Bannockburn, IL: IPC, 2011). 11. IPC J-STD-001F, "Requirements for Sol- dered Electrical and Electronic Assemblies," (Bannockburn, IL: IPC, 2014). Over the past decade, microfluidic cell sorters have emerged as a promising new tool for single cell sequencing, rare cell isolation, and drug screen- ing. However, many of these microfluidic devices operate at only a few hundred cells per second, far too slow to compete with commercial devices that operate on the order of tens of thousands of opera - tions per second. Now, a team of researchers at Penn State has developed a cell sorter based on acoustic waves that can compete with existing fluorescence-acti- vated cell sorters and is an inexpensive lab on a chip. The system can sort about 3,000 cells per sec- ond, with the potential to sort more than 13,000 cells per second. The researchers achieve the speed by using fo- cused interdigital transducers to create standing surface acoustic waves. The narrow field allows the sorting to take place at high speed while gently manipu- lating individual cells. "Our high-throughput acoustic cell sorter is expected to maintain cell integrity by preserving not only high viability, but also other cellular features," said Tony Jun Huang, Penn State profes - sor of engineering science and mechanics. "The acoustic power intensity and frequency used in our device are in a similar range as those used in ultra- sonic imaging, which has proven to be extremely safe for health monitoring, even during various stages of pregnancy. With the gentle nature of low- power acoustic waves, I believe that our device has the best chance of preserving cell integrity, even for fragile, sensitive cells." Because the device is built on a lab-on-a chip system, it is both compact and inexpensive -- about the size and cost of a cell phone in its current con- figuration. With the addition of optics, the device would still be only as large as a book. The research- ers fabricated the acoustic cell sorter in Penn State's Nanofabrication Laboratory using standard lithog- raphy techniques. The researchers, who are from Penn State, Ascent Bio-Nano Technologies and the National Heart, Lung and Blood Institute of the National Institutes of Health, published their work in a recent issue of Lab on a Chip. In future work, the researchers plan to integrate their acoustic cell- sorting unit with an optical cell-de- tecting unit with the goal of increas- ing throughput to 10,000 events per second. 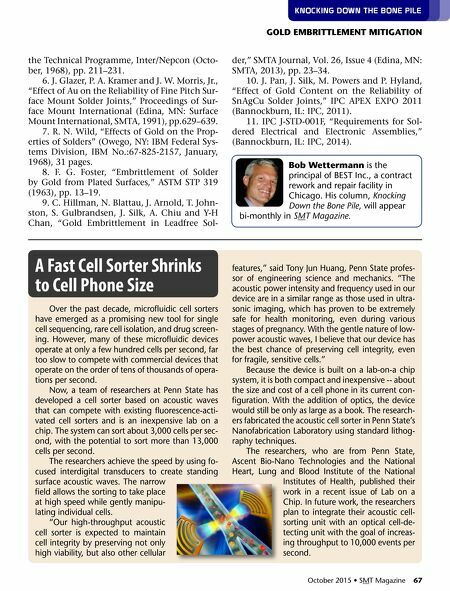 A Fast Cell Sorter Shrinks to Cell Phone Size knocking down the bone pile bob Wettermann is the principal of BEST Inc., a contract rework and repair facility in Chicago. His column, Knocking Down the Bone Pile, will appear bi-monthly in SMT Magazine.